With Trafalgar Square to the south, Piccadilly Circus to the west, China Town to the north and Covent Garden to the east, Leicester Square is right in the thick of The West End. It is the beating heart of British cinema, with all the major European premieres happening there - you'll often see crowds of fans, expectantly awaiting the arrival of the stars outside one of the state-of-the-art cinemas which line the square. 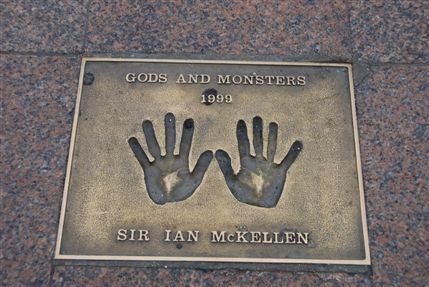 Bronze casts of actors' hand imprints also remind you of the film star glamour associated with Leicester Square - Tom Cruise, Bruce Willis, Sylvester Stallone and Sir Ian McKellen are just some of the A-listers who've contributed. In the middle of the square is a small garden area with plenty of benches which are overlooked by statues of Shakespeare, Hogarth, Charlie Chaplin and 'the founder of scientific surgery', John Hunter, whose collection of 10,500 anatomical specimens were kept in his house on the square. The discount theatre tickets office is located next to the John Hunter gate and it's not a bad spot for a rest or to eat a packed lunch - although if you have time, nearby St James's Park is far better.